German Shepherds and Much, Much More! I was tired from the previous day's travels and my cold was still keeping me down, but I was restless. I laid around again for three hours, trying to decide what to do for Christmas Eve. 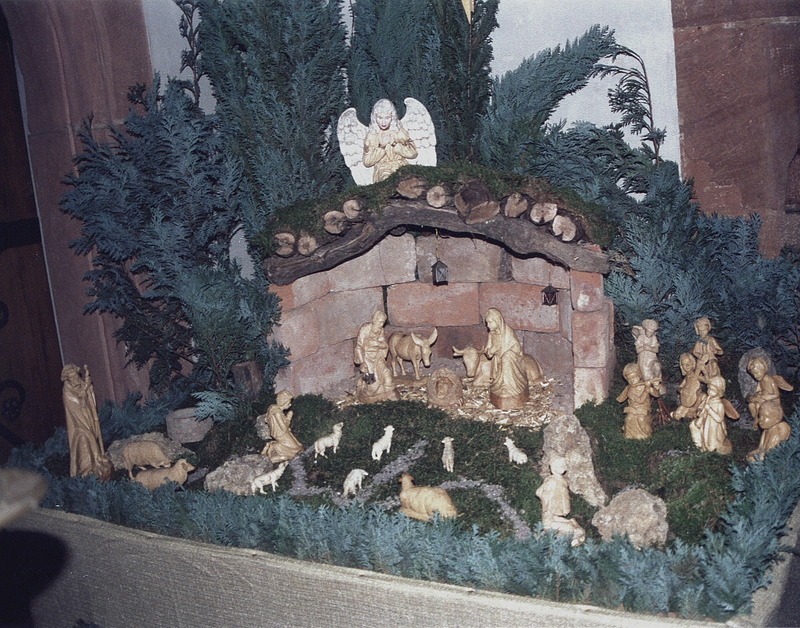 My Dörrenbach trip had been a personal journey, so I had not attempted any socializing with my co-workers for Christmas. I was on my own. I started looking into the chances of driving to France. The prospect of any real exploration in that country would be realized after the New Year when the Euro-Dollar would kick in and I could travel all over Europe (except Switzerland and England) using the same currency. Yet, I had skipped church on Sunday to see Dörrenbach and was feeling I needed to go for Christmas. I read my bible, prayed a bit, and took a nap to see what the Lord laid on my heart. I awoke with the urge to go back to Dörrenbach. 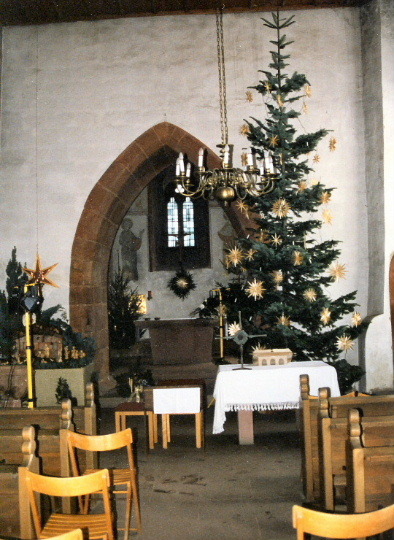 If I left immediately I could reach Dörrenbach early, find out when services were, and then make a run for France (if there be time), and then back to Dörrenbach to celebrate Christmas in the land of my (dead) ancestors. On this trip I was flawless--I drove there without a single mistake, made it to St. Martin Church, and *gulp* the church was open. I reverently walked into this church some say dates back to 1304 and saw Ursula Klitsch-Kipper, arranging the church for the Christmas Eve service. She knew enough English to help me. 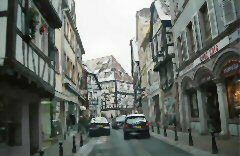 She said services would be in two hours, so we exchanged email addresses, I took a few photos of the church (she said the paintings there were originals from 1304), ran down the ice/snow-covered road to my car, and shot off for France. 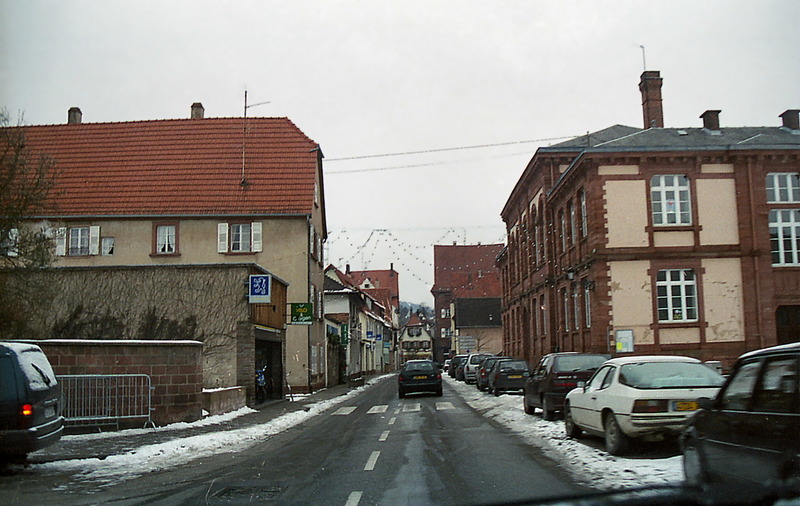 France was 8 kilometers from Dörrenbach. 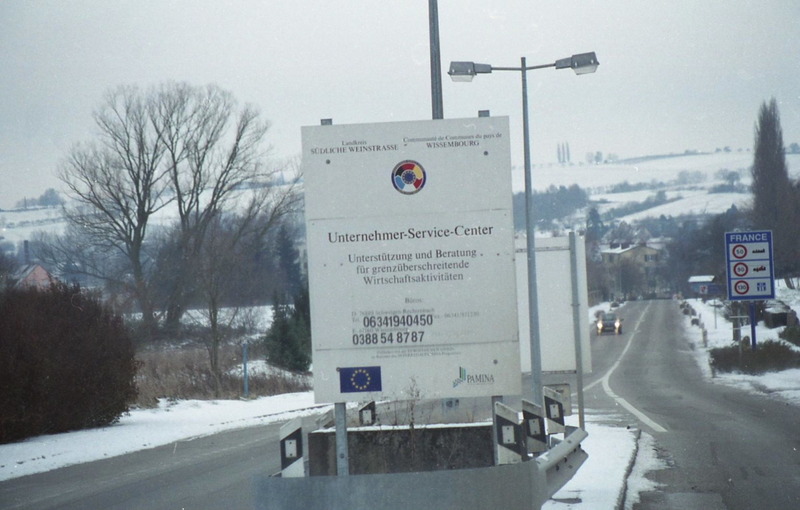 There were no checkpoints at the border, just a sign that said 'France'. How dramatically awe-inspiring. Lovely--after a few hundred meters I began to wonder, am I in France already? 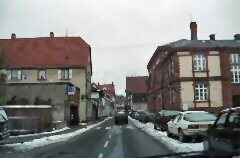 I was driving through a lovely little French town named Weissenborg, which probably had something to do with wine (or Weiss, my ancestors--the word meaning 'white' in translation). 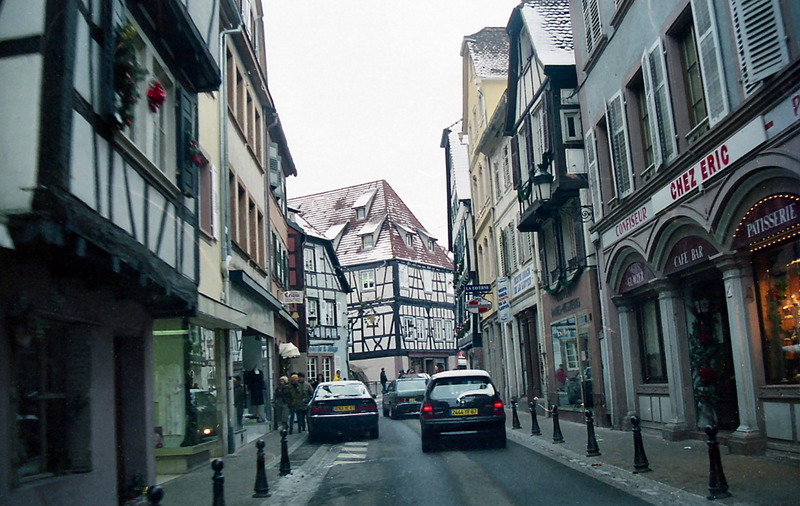 This was the Alsace region of France, still with some German sounding names. I drove 16 kilometers, jumped out of the car, wandered through a grocery store, said,"Woo hoo! I'm in France!" and then headed back to Dörrenbach, in Germany. 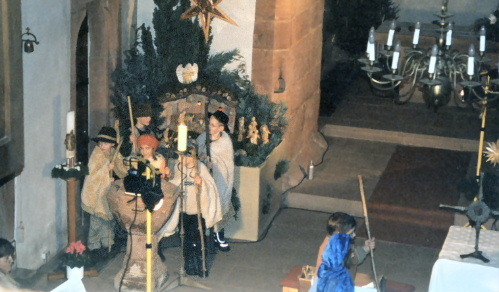 I got there too early and walked into the rehearsal for the children's mass. I was politely asked to leave. 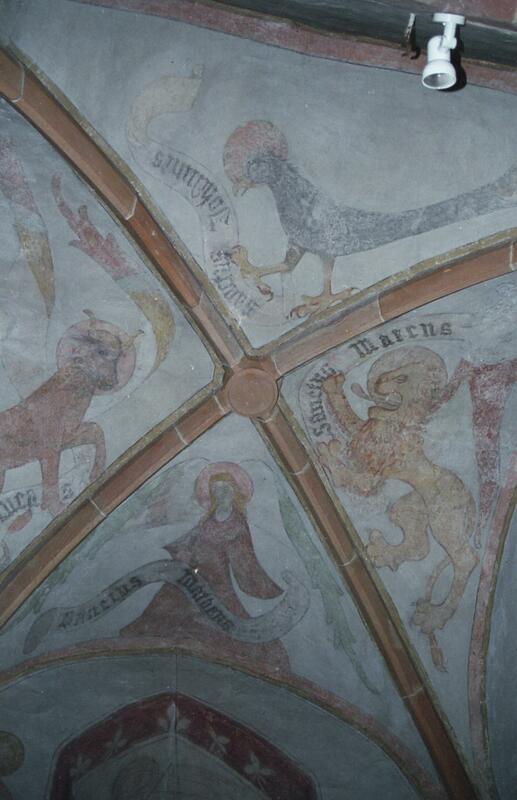 So here I was again, freezing to death in Dorrenbach, still with my cold, but I noticed some things. There was a display outside one of the stores with all the wines and alcoholic beverages made in Dorrenbach. Dorrenbach was founded in 992AD--for those weak on math, made it 1008 years old, or, as my mother would say--Its real old. The clouds rolled in, and snow started pounding the little hillside village. 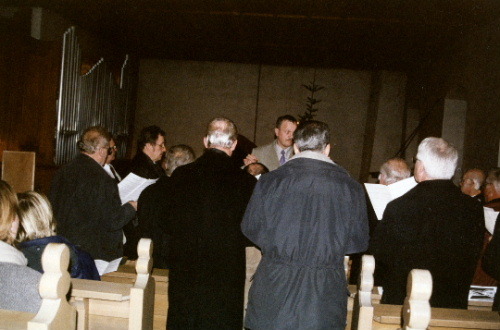 The church was full--packed with Germans who had a slight scent of alcohol. After being so polite to the women, elderly, and families, I lost about five seats and found myself in the balcony where I couldn't see a thing. 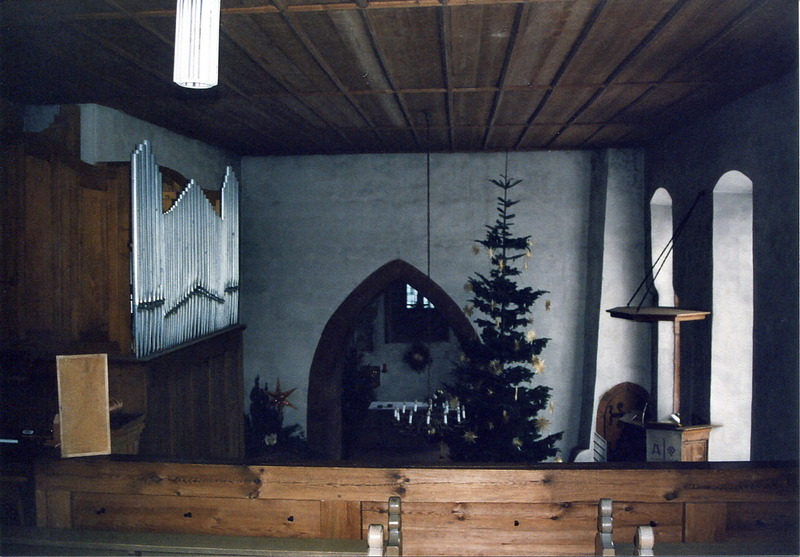 The services at Dörrenbach's St. Martin church are Protestant/Catholic. Yes folks, it's neutral! The Irish could take a hint. The priest is Protestant but the service is both. His name was Dr. Grimm, and he had the face (and name) you'd expect to see in an old Sean Connery James Bond movie. It's easy to look at him and imagine him laughing and saying,"In two more days Bond will be dead and the world will be mine!!! He had bad teeth that only added to the aura, and he smiled a lot. He also played the Pan Flute! (I bought his CD at the church). I took about seven copies of the music we were singing, slipping papers into my back pack for souvenirs each time I moved. I sang in German, to the best of my ability. It was strange, yet, amusing to be singing Christmas classics in German that at first I had to bite my lip to stop from laughing and then I was overcome by emotion. 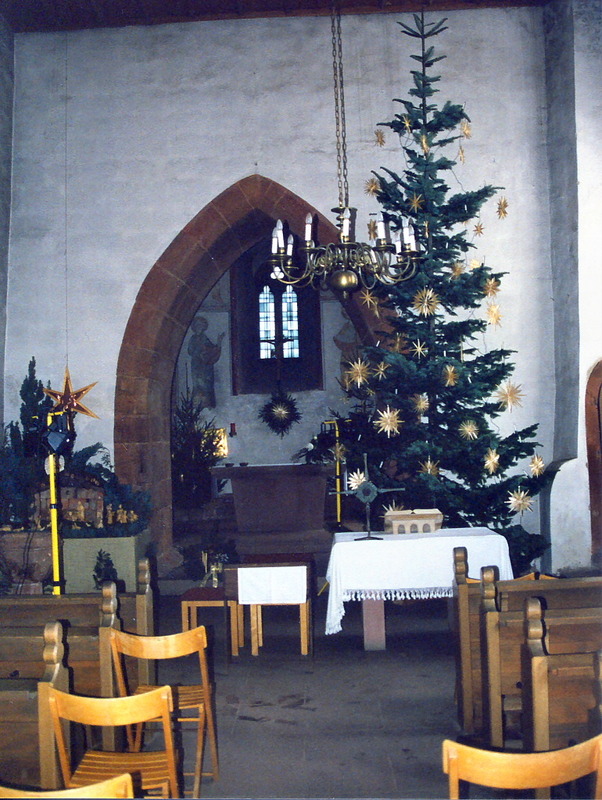 This was the moment I will always remember from my trip to Germany--singing Silent Night in German, on Christmas Eve, in the village of my ancestors, the exact same church my Great Great Grandfather sang in 150 years ago. Most of the church hadn't been changed in that long. The choir sang in the balcony in front of me (I could have goosed them so easily) and they were wonderful. I loved them so much I couldn't help but sing with them and shed tears of joy. I even took a flash photo of them. It was Christmas...I could get away with it. The people were very friendly and on three occasions they shook my hand, put arms around me, smiled and spoke to me in German and I'd just grunt and smile. I had no idea what they were saying. Maybe my fly was open? Oops--I never checked. Is that what weinerhaggen means? Ursula Klitsch-Kipper introduced me to Dr. Grimm (hehehe) and my first reaction was to reach for my cufflinks with the poison darts so I could get a shot to his neck before he tied me up and tossed me into his shark tank. Then I ran into Stephanie Westwood who was a German, Dörrenbach native, married to Kevin Westwood (married in St. Martin's Church), an Englishman from London. 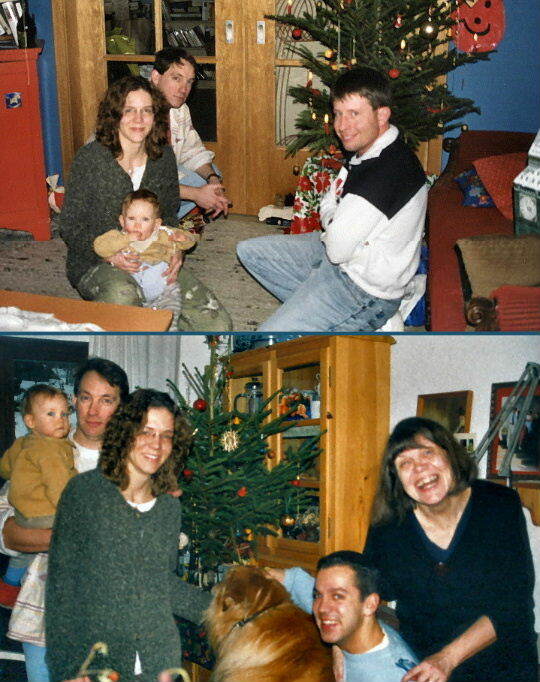 She was in church with Kevin, her 14-month daughter Mable, and her brother Felix Hanselmann. They'd overheard I was in Dörrenbach looking for relatives. Stephanie said her neighbor was an elderly lady named Kate Weiss (frau Weiss she called her) who died a few years ago. She asked me to come look at it. So I followed them up to her mother's house just above the church. 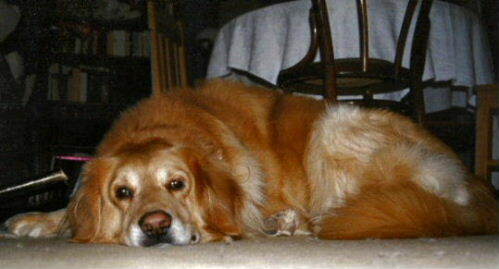 Her mother was Ingrid Hanselmann who lived with a large Golden Retriever-looking dog named Tibor. They were a lovely family and Tibor loved me. I got licked in the face so many times I took off my glasses any time he got near. They invited me to open Christmas presents with them (they gave me a bottle of Dörrenbach wine) and then we had a little German meal, sang Christmas songs (in German again) and sat up until after midnight, chatting. Felix looked to be in his mid-20's, and we connected the best although Kevin, being British, seemed to understand my humor best. Felix and I talked guy talk--history, world geography, destroying Porsches, women...Ingrid and Stephanie were very friendly, with Ingrid being the mother, always asking me if I wanted food or clothing. The most embarrassing moment was when I was trying to make interesting conversation, and I asked Ingrid what it was like during WWII. She looked confused--Felix looked confused--Stephanie--confused. Mable nervously drooled and Tibor covered his eyes with his paws. I tried to restate my question and then Ingrid said, with a smile,"I was born in 1946" Oopsss...I blushed. No comeback for that question. Stephanie was very interesting. Mable was cute and well behaved. She hobbled around the big house, mumbling unintelligible things just like my mother does when I visit. Tibor just liked being petted and stroked and would stick his paw out to me when I ignored him. We took Tibor for a walk while Stephanie and Felix pointed out some of the more interesting sights in Dörrenbach. Dörrenbach was been badly bombed in World War II (the Americans, however, think it was bombed very well), and had been evacuated. Many of the original buildings had been destroyed save for the church, the Town Hall, some public buildings, and a few houses. I don't know if any horses were killed there during the war. By that time the Hanselmann's asked me to stay the night, and I graciously accepted. I stayed in a little finished room with skylights, in what looked to be a former attic. It was cozy. I awoke in the morning with a beautiful view of the hillside village. After a quick shower and breakfast, we exchanged email addresses, hugs for the ladies, handshakes with the men, tongues from Tibor, and I bid them all farewell. Ingrid gave me a small bag of oranges and little goodies. She was such a sweet mother. I donï¿½t think she wanted me to leave.